Sometimes called the spiny anteater, the short-beaked echidna (pronounced e-kid-nuh) measures 30-45 cm (13.5-17.5 in.) long and weighs 2-5 kg (6.5-14.5 lb.). 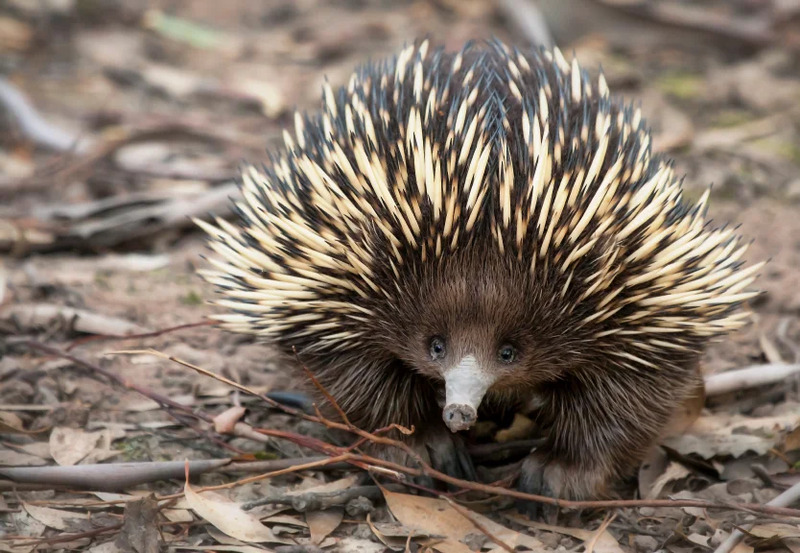 Although it resembles a porcupine or hedgehog, closer inspection of the echidna reveals some of the animal’s more unusual traits. Echidnas are monotremes, or mammals that lay eggs. They have a lower body temperature than other mammals, maintaining temperatures around 31-32° C (87.8-89.6° F). Similar to reptiles, their legs protrude outwards and then downwards, resulting in a waddling effect when they walk. Two types of fur cover their body. A coat of short, coarse hair insulates echidnas from the cold, while longer hairs act as spines, protecting them from predators. Their sharp, creamy-colored spines are 50 mm (2 in.) in length and are composed of keratin, the same material that makes up our fingernails. Consuming ants, termites, grubs, larvae, and worms, the echidna is specially-adapted to hunt its prey. It has a pointy snout that can sense electrical signals from insect bodies. Once it detects its prey, the echidna uses its long, sharp claws and short, sturdy limbs to dig into the soil and expose the invertebrates. It finishes the deed by licking them up with its long, sticky tongue. Echidnas do not have teeth, but they do have horny pads in their mouths and on the back of their tongues which grind the prey. Short-beaked echidnas are found all over Australia and southern New Guinea, in contrast to long-beaked echidnas, which reside only in the highlands of New Guinea. Limited only by an insufficient supply of ants or termites, short-beaked echidnas live in a range of climates and habitats. They are able to find shelter in rocks and fallen trees. When confronted by predators, such as goannas (large Australian monitor lizards), dingoes, foxes, feral cats, dogs, eagles, and Tasmanian devils (which even eat the spines), the echidna employs several tactics for defense. On hard surfaces, they may run away or curl into a ball exposing only the spines. In other cases, they may dig into the soil or wedge themselves into a crevice or log, again only exposing the spines. Echidnas are largely solitary creatures and only convene to mate. Mating season spans from July to August. A few weeks after mating, the female echidna digs a burrow and lays one soft, leathery egg into a temporary ‘pouch’, which she makes by a folding a section of her lower abdomen skin. After 10 days, a blind, hairless baby echidna (known as a puggle) hatches and attaches itself to a milk patch inside the pouch. For the next 8-12 weeks, the puggle nurses inside the pouch until it develops spines. At this point, the puggle must vacate the pouch, but it still stays in the burrow for the next 6 months and continues to nurse. The IUCN Red List lists the short-beaked echidna as a species of least concern. Although short-beaked echidnas are considered common and widespread, they are protected by law in Australia. 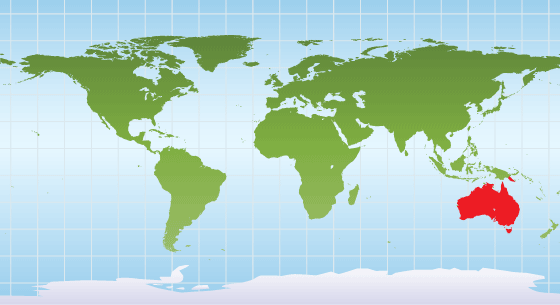 Threats include road accidents, bush fires, and droughts. 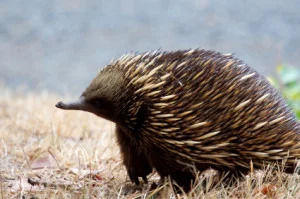 If you live in Australia or New Guinea, you can help echidnas by driving carefully, keeping pet dogs under control, and leaving gaps under fences so echidnas can roam freely. Short-beaked echidnas live in a range of climates and habitats all throughout Australia and southern New Guinea.